Home » SUPERVATOR Rare Vintage Original Marvel & DC Comic Book Art & Superhero Posters » DC Comics Green Arrow promotional stickers/decals set: Never for sale to public! DC Comics Green Arrow promotional stickers/decals set: Never for sale to public! 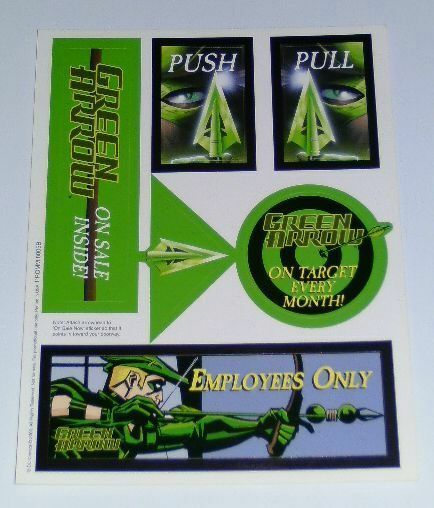 This is a super rare 2000 DC Comics sheet of GREEN ARROW promo decals stickers. This promotional decal/sticker sheet measures about 11 inches by 8 inches and was NEVER FOR SALE TO THE PUBLIC AND MADE IN VERY SMALL QUANTITIES. It's in VERY FINE/NEAR MINT CONDITION and WAS NEVER USED.